Glucose is the energy that humans were designed to run on. We source our glucose from the digestion of carbohydrates, proteins and fats. The body uses insulin to keep our blood glucose in a narrow range, allowing the brain to function at its best. If insulin levels are too high, due to chronic excess sugar and carbohydrate consumption, this keeps sugar in our cells and starves the brain of fuel, leading the brain to want more sugar. Over time, we can develop insulin resistance, which leads to the accumulation of excess body fat, diabetes and heart disease. Every extra teaspoon of refined sugar that we eat throws our body out of balance – it is more a pharmaceutical drug than it is a nurturing food. (1) The minerals needed to digest sugar – chromium, manganese, cobalt, copper, zinc and magnesium – have been stripped from the sugar during the refining process. This forces the body to deplete its own mineral stores to process sugar. Fructose is another form of sugar, which we derive mainly from fruits and vegetables. On a daily basis, it is recommended we consume no more than 15 grams/day of fructose from natural sources. Mixed with vitamins, minerals, enzymes and phytonutrients, nature moderates the negative metabolic effects. Sugar stimulates a physiological stress reaction that provokes adrenaline and cortisol release and thickens the blood. Sugar effectively disables your immune system by impairing white blood cell function. Sugar induces significant oxidative stress in the body. Sugar appears to fuel cancer cells. Sugar is a powerful drug. What’s wrong with drinking soda and fruit juices? When teens ingest sodas, concentrated fruit drinks, and processed food where the fructose is separated from fiber, they end up taking in an average of 72.8 grams of fructose per day! This is more than 4 times the recommended daily serving. And 25% of people consume upwards of 130 grams/day. It takes 3 or 4 oranges to make one 8 oz glass of orange juice. Our bodies are not made to handle 3 or 4 oranges in one sitting. This is a lot more fructose than the body is meant to process, which puts enormous stress on the liver to metabolize on a daily basis. We are familiar with the beer belly, but fructose has a similar effect, creating the “soda belly.” Even Similac for infants contains 43.2% corn syrup solids – that’s like a baby milkshake! 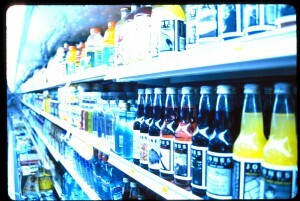 Regular high fructose consumption increases uric acid levels which, over time, leads to hypertension and gout, causes chronic low-level inflammation, increases fat storage and elevates triglycerides, causes insulin resistance, and alters the brain’s ability to recognize satiety (fullness). The earlier you expose kids to sugar, the kids will have increased risk of metabolic disease later on in life. They say artificial sweeteners aren’t sugar and that diabetics can use them, too. Aspartame is a popular additive in Nutrasweet, Equal, crack seed snacks, gum, sugar-free/fat-free packaged goods, and even in multi-vitamins! Even though the CDC acknowledges that aspartame causes aggressive behavior, hyperactivity, extreme numbness, excitability, memory loss, liver impairment, cardiac arrest, headaches, tinnitus, seizures, suicidal tendencies and severe mood swings, they still concluded that aspartame is safe to ingest. But it is important to note that 10 federal officials involved in approving aspartame subsequently took private sector jobs linked to the product’s manufacture. Donald Rumsfeld was the former CEO of the corporation which created aspartame, and he vowed to ‘call in his markers’ and use political rather than scientific means to get FDA approval. (4) Like MSG and hydrolyzed vegetable protein, aspartame is an ‘excitotoxin,’ a chemical that causes the brain cells to become so over-excited that they very quickly burn themselves out and die. A 2007 study in the American Heart Association journal Circulation looked at more than 6,000 healthy people, and after four years, 53 percent of people who drank an average of one or more soft drinks per day developed metabolic syndrome. Those who drank one or more diet soft drinks a day were at a 44 percent higher risk. (6) We ingest food additives daily, yet their approval does not require the same scientific thoroughness as drug approval. So what about natural sweeteners, like honey, agave nectar or coconut syrup? Honey typically has about the same ratio of fructose to sucrose as high fructose corn syrup. Agave nectar can range from 56-92% fructose, depending on the brand and how much it’s been processed. Molasses and maple syrup are boiled and maple syrup is refined as well. Try raw coconut nectar and raw honey, which still retain much of their vitamins, enzymes and minerals. Stevia, an herb that mimics the taste of sugar, does not feed candida (yeast) nor cause the other problems associated with sugar and artificial sweetener consumption. What’s yeast got to do with it? When the gastrointestinal “good” bacteria, like acidophilus and bifido bacteria, and your immune system are healthy, candida (yeast) is kept in check. But food chemicals, artificial sweeteners, processed oils, processed high fructose corn syrups, processed sugars, and pharmaceutical drugs can cause a candida population burst. Even though candida is naturally present in the body, it can cause problems if there is an overgrowth, resulting in candidiasis. When this happens, the yeast branches out with hardened spiny tendrils that puncture the intestinal wall; then the candida begins colonizing outside of your gut into other parts of your body. (7) Alcohol, sugars, artificial sugars, dairy, and refined carbs and even complex carbs feed and promote candida overgrowth. Prolonged use of antibiotics play a major role in the development of candidiasis. Antibiotics eradicate bad bacteria that cause certain diseases and infections. However, they also destroy the good bacteria that keep the candida in your body under control. Prolonged use of strong doses of antibiotics can lead to an imbalance in your gut flora, allowing bad bacteria and yeast to overgrow. If your digestion is inefficient, if you aren’t properly eliminating body wastes, or if your pH is too acidic, candida can spread into your bloodstream and deposit in other tissues and mucous membranes, like in your throat (also known as thrush), in your nasal passages, and in your gut. You may then become distended, constipated; allergies may begin to form, psoriasis/eczema may flare, skin rashes and adult asthma symptoms may occur. What would once be considered normally benign yeast has literally morphed into an aggressive, destructive, fungal pathogen that can cause a variety of health problems from head to toe; often perplexing traditional doctors. So what’s the best sugar you can eat? Really, none. Avoid processed fruit juices and eat whole fruit: have a handful of berries, an apricot, guava, or kiwi, which are low in fructose. If you must add something to your food or drink, use the least processed that you can get and use sparingly. Otherwise, your healthiest bet is to drink pure spring or filtered water. 2. Sisson M. “The Definitive Guide to Sugar,” http://www.marksdailyapple.com/the-definitive-guide-to-sugar/, accessed Apr 22, 2011. 3. Lustig, RH. “Sugar: the Bitter Truth” Youtube video uploaded Jul 30, 2009 by UCtelevision, http://www.youtube.com/watch?v=dBnniua6-oM, accessed Apr 14, 2011. 4. Thomas, P, “Aspartame,” The Ecologist, Sep. 2005. 5. Bowen, J, The Lethal Science of Splenda, May 2005, http://www.wnho.net/splenda_chlorocarbon.htm, accessed Apr 14, 2011.